A Second Dome for the Grand Mesa Observatory! 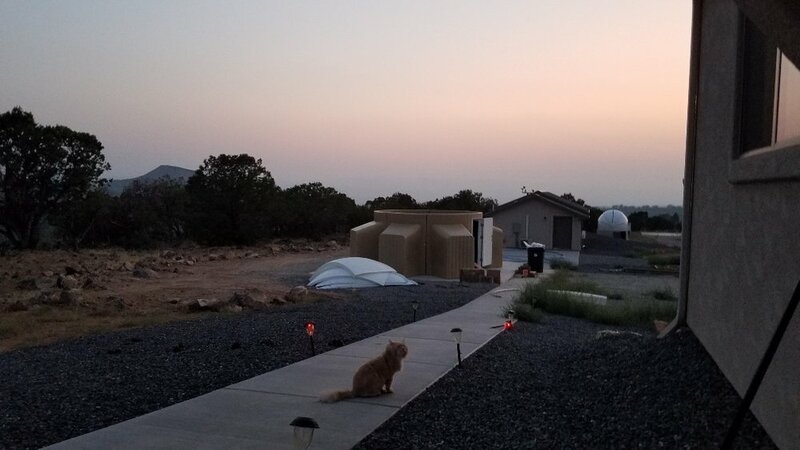 After months of on-site preparation and weeks of transportation coordination, the Grand Mesa Observatory has finally taken delivery of our brand new SkyShed PodMax observatory dome! This behemoth came all the way down from Canada, and after being unloaded from the freight truck (where it was packed in with a lifetime supply of peanut butter) the 12.5ft-wide dome found its final resting location on GMO’s most-recently-poured concrete pad. We are still piecing together all of the gear the will be housed inside the dome, but GMO will be working with a coalition of scientists from universities all around the country to prepare the instrumentation package for proper academic use. At the moment this system will likely be centered around a 16" Ritchey-Chretien optical tube which will be loaded on a Paramount ME, and the imaging package will be built around one of the brand new FLI4040 cameras. As we continue to grow it is likely that the setup will too, but luckily there is plenty of headroom with the SkyShed Pod as the dome itself has a 44" slot that opens 22" past zenith to allow for a scope up to 32" in diameter! The goal of this facility will differ from that of our main astroimaging facility, with the primary aim here being to provide an easily-accessible, research-grade system to various educational institutions and organizations free of charge. The dome will work on an appointment-based system that will ultimately grow in to a proposal based application as the dome's user-base increases. This system will be capable of conducting a wide array of tasks from photometry to spectroscopy to classical astrophotography, but other applications would not be unwelcome if you know of a team with more specific needs. By providing such powerful tools to our team members it is the hope of GMO that these scientists will be able to conduct better research, in less time, and with less red tape than would be found with typical University-grade setups. In many cases we will also just be providing the simple asset of darker skies than anything found near most schools, but whatever the need Grand Mesa Observatory would like to work with as many teams as we can reasonably accommodate! If you or someone you know works for an academic institution and thinks they could benefit from our services, please contact us using the form (found HERE). GMO would like to thank all of the team members and volunteers who have been helping coordinate the delivery and get everything assembled. In particular, a special tip of the hat is owed to Chuck Burch who has been leading the assembly team for the dome itself, as well as leading our efforts to prepare the eventual scientific instrumentation packages. The dome is a multi-day setup procedure with a fully functioning crew, and without the help of folks like Chuck and his team it would probably have been a multi-week procedure. We will continue to update you on the progress of this facility, and we invite you to contact us with any further inquires you may have.